Corbett Blake is a child who wants to follow in his father’s footsteps and be a knight, but is slated to become a sorcerer’s apprentice instead. 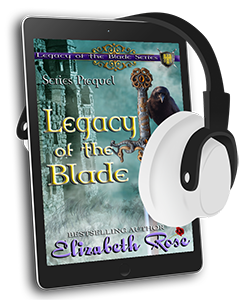 This is a short story that is the prequel for Legacy of the Blade Series. Seven-year-old Corbett Blake held tightly to the hand of his three-year-old sister, Wren as they watched their grandfather’s body, the late Lord Frederick of Steepleton, being lowered into the ground. Their father, Lord Evan Blake walked forward and threw the first shovel of dirt over the man. Frederick was Evan’s late father and had also been Lord of Blake Castle. Corbett’s mother, Lady Eleanor, walked up next, taking the shovel from her husband and only lifted a small amount of dirt since she was very pregnant and about to give birth any day now. She was carrying twins, or so the old sorcerer had told them. He’d foreseen it in his gazing crystal. Corbett’s mother then turned around and handed the shovel to him, her bright blue eyes consoling him as she did so. His mother was the vision of beauty with her long dark hair braided and twisted around each ear, and her head covered with a light transparent veil. He hesitated, his eyes scanning the grounds of the church graveyard, seeing the huge crowd staring at him now. His uncle, Brother Ruford smiled at him and just nodded his tonsured head slowly, keeping his hands folded in prayer and hidden beneath the folds of his coarsely woven black robe. Corbett took the shovel gingerly, never having done this before. He moved forward cautiously, stopping at the edge of the hole in the ground. His grandfather’s wooden casket stared up at him, and just the sight of it had Corbett’s stomach clenching in a vast array of emotions. He knew what a fierce warrior Frederick Blake had been, losing his life in battle protecting King Edward III. He also knew his father, Evan had been in that battle and the reason Frederick’s dead body was brought from the field and not left for the ravens to peck out his eyes. A raven landed on the wooden cross serving as a grave-marker just then, letting out a squawk and causing Corbett to jump. Then the bird headed back up into the sky. It startled him to be thinking about ravens and then have one appear out of nowhere. Ravens were an eerie type of bird that Corbett was sure came directly from Hell. He turned his head quickly to see his mother rubbing her large stomach and comforting his sister, Wren. Wren’s long, dark hair fanned out around her and her eyes focused on him. Then she let go of her mother’s hand and ran forward to join him. “I’ll help, Corby,” she said bravely, being much too young to be of any use in lifting a shovel of dirt. She adored him, and Corbett knew she’d do anything for her big brother. “No, Wren, go back to mother,” he told her, sending her on her way, and looking up to see not only his father and uncle, but the old sorcerer, Orrick conversing softly amongst themselves and looking in his direction. He turned around again, thinking of the dream he’d had a sennight ago that warned him his grandfather would die. He’d seen this exact scene in his head, and knew that by dropping the dirt atop the dead man, he’d be more or less sealing his fate as some kind of seer, or having some sort of special powers. It was something he didn’t really believe, and he now regretted ever having told Orrick, since the mystical man was a good friend of Corbett’s father. He shoveled the dirt atop quickly, turning only to have the old sorcerer take the shovel from him next. “You are special, Corbett,” the old man told him. “You know things. You have dreams.” Orrick was a tall man with a weathered face and mysterious eyes that seemed to change from blue to green and even to amethyst at times. He had long white hair and a beard and mustache as well. And he wore a long, purple cape over a dark tunic and hose. The cape flowed out behind him when he walked, making the man seem ethereal. “Nay, it was naught but a silly dream, that’s all.” Corbett looked back up to his father who was watching them intently and had a new look of sadness upon his face now. His father was a handsome man with regal features and dark hair. And he always made sure to look his best, and even after a battle would change into fresh clothes and clean his wounds quickly, not liking to been seen looking less than perfect.